It’s easy to get excited about making fruit desserts when you are looking at a beautiful display of fresh, in-season fruit at your local grocery store or farmers’ market. Peaches have a lovely floral aroma and ripe plums smell as sweet as honey. Fortunately, there is no need to resist the temptation to stock up on fruit because there are all kinds of amazing dishes that you can bake with them. Pies and tarts are just a couple of options, but a classic cobbler is always an easy way to enjoy fruit in a dessert and this Plum and Peach Cobbler is a perfect example. I used a mixture of fresh peaches and fresh plums in this cobbler. The flavors of the two stone fruits blend together beautifully, for a sweet and richly flavored filling. They also look absolutely beautiful together, with the bright yellow color of the peaches contrasting well with the darker red color in the plums. Most of the color in the plums comes from the skin of the fruit, so I recommend not peeling your plums before you use them. Plum skins are also quite delicate, so they don’t take away from the fruit itself when you’re eating the cobbler. The peaches, on the other hand, should be peeled before you add them to the filling. When picking out fruit for the cobbler, choose fruits that are ripe but still slightly firm. Firmer plums and peaches will be easier to work with than very soft fruits, and they’ll hold their shape during baking without breaking down. Cut them into approximately equal slices – which means that plums should be quartered, while peaches can be cut into 6-8 slices, depending on the size of the fruit. 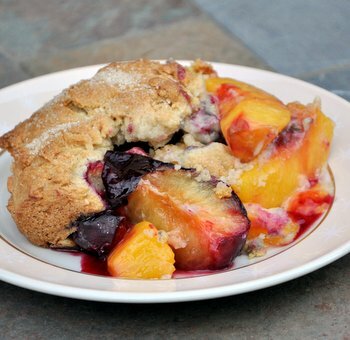 I used about equal parts of plums and peaches, but you can always slant your cobbler filling towards one or the other, depending on how much fruit you have in your kitchen, or incorporate other fruits like nectarines or apricots. Peel peaches, remove pits and cut into 6-8 slices. Cut plums into quarters and remove pits. Place fruit into a large bowl and toss gently with 2 tbsp sugar and 1/2 tbsp cornstarch. In a medium bowl, whisk together flour, sugar, baking powder and salt. Pour in melted butter, milk and vanilla and stir with a fork until the dough comes together into a soft, slightly sticky dough. Arrange fruit in an even layer in a 9×9-inch square baking dish. Break up cobbler topping with your fingertips and spread it evenly over the fruit. It is fine if some pieces of fruit are still visible. Bake for 45-50 minutes, until topping is golden brown and fruit is tender when pierced with a sharp knife. Tent the cobbler with a piece of aluminum foil for the last 5 minutes if you feel your cobbler is too brown. Allow to cool for at least 15 minutes before serving. 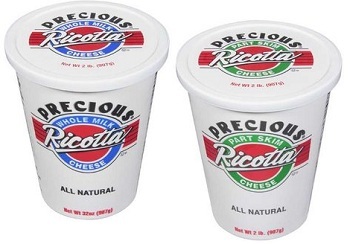 Previous PostPrevious What is ricotta cheese? That sounds so good. I love peaches in a pie or cobbler. I’m excited my Italian plum tree is producing this year. 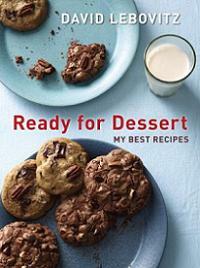 Maybe I will have enough to try this recipe. I made this yesterday and it turned out fabulous! Thanks for the recipe! Just noticed a typo in your description. Might be confusing to people who look for pears in the recipe. I used a mixture of fresh peaches and fresh pears in this cobbler. This recipe was fantastic! Great flavor and texture. My version was a bit altered as I had 16oz cans of plums and apricots each that I had picked up on the damaged clearance at the supermarket that I needed to use before they went bad. The plums were in light syrup and the apricots were in pear juice. I poured the liquids from BOTH cans into a 8×8 baking pan. I followed the recipe exactly, only substituting 1 tablespoon of cornstarch and adding just a bit more sugar when mixing the fruit (I like my desserts sweet!). The dough I palmed flat into a sort of crepe shape and layered them on top; add as a cubed crumble for a more traditional dish. I baked at 350 for 1 hour, but make sure you check every so often so the topping doesn’t burn! The juice/syrup should be very hot and very bubbly. Let stand for an hour or refrigerate to congeal the juice faster. Serve with a sprinkling of sugar in the raw and whipped cream/cool whip.